If you would like to move to the great country of Canada stress free, then Guardian Cargo Logistics is the company for you. International moves can be tricky, so it is highly important that you choose a moving company that is well equipped and experienced in international relocation. Guardian Cargo Logistics has been in the moving business for long enough to have perfected the art of international and long distance moving. You are sure to have a positive experience with our professional team. 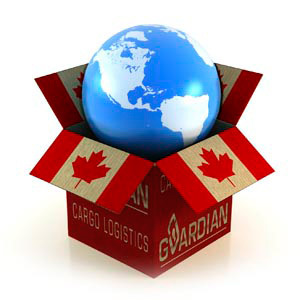 Moving to Canada is simple with Guardian Cargo Logistics. Guardian Cargo Logistics works hard for our customers; we strive to make your move as comfortable and hassle free as possible. For this reason we only employ the best of the best to get your Canada move done right. The staff at Guardian is highly trained to handle a variety of moves; from big to small and local to international, Guardian movers are prepared and qualified to handle your move to Canada. The choice is clear; if you want fantastic, affordable and professional Canada moving services then look no further than Guardian Cargo Logistics. Guardian Cargo Logistics prides itself on providing professional and courteous moving services. Our team is highly trained to carefully handle the household and commercial goods of our customers. At Guardian we know how valuable your belongings are to you, which is why our staff treats them as if they were their own; with great care. Your belongings are in good hands with Guardian Cargo Logistics. Not only is our moving crew superb, but our Guardian relocation specialists are the backbone of our operation. Our representatives go above and beyond to make sure each and every customer is well taken care of. From tips to advice and problem solving, our relocation specialists can do it all. You are sure to love the spectacular customer service of Guardian Cargo Logistics. Call up one of our friendly representatives today and let’s get started on your move to Canada. Choosing the right moving company to handle your equipments is critical to your moving plan. Always check the company’s credentials, length of business operations, and feedback from past clients, if available. Feedback is very important. You may browse in the internet for the name of the company and read if there is any information that would assure you that, they really take care of their customers things well. We offer to take care of your things as you would take care of them personally, if you choose our moving services to Canada.